Hello, weekend—we’ve been waiting for you all week! We all know what that means… time to adjust your belt buckle and get your knife and fork at the ready. We’re going to brunch! Eat your way through smashed avo, eggs bene, waffles and—one of our total faves—pancakes! The only thing better than a stack of pancakes, is a stack of pancakes on the cheap. Yep, we’re talking about ASB’s mouth-watering Brunch On Us. Order brunch this weekend (or any weekend until the end of the year) and you’ll get 15% off your meal. Pay with your personal ASB Visa credit card between 8am and 12pm and the sweet, sweet discount is yours. For the full terms and exclusions, head to the bottom of the page. Takapuna fave Honey Cafe keeps the good times rolling with their orange ricotta pancakes. The stack of deliciousness is topped with berry compote and honeycomb mascarpone—what a duo! Packing a zesty punch, these inventive pancakes are not to be missed. P.S. If you’re after something more savoury, Honey Café’s chicken salad with halloumi, mango and avo is also divine. Tucked away in an unassuming mall, you’ll stumble upon Auckland newcomer Oak Eatery. 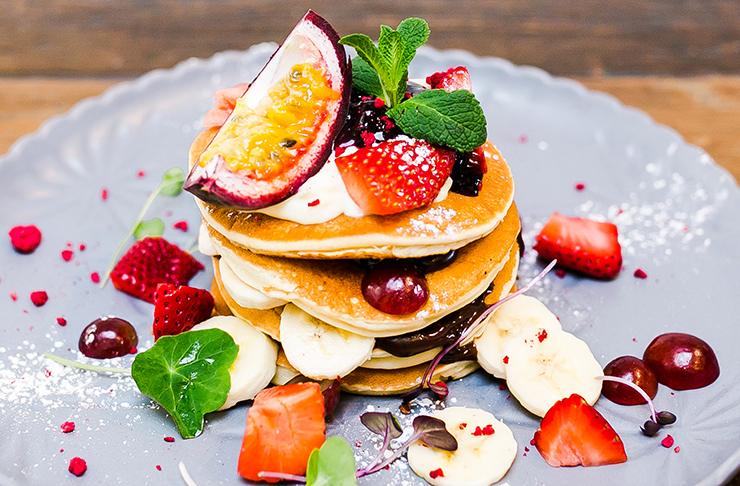 We’re (coco)nuts about their pancakes infused with coconut and served with seasonal fruit. Their pancakes are just the way we like them: light and fluffy with a slight crunch on the outside. Better yet, the unmissable dish also stars honeycomb and cinnamon-flavoured cream. On ya, Oak! 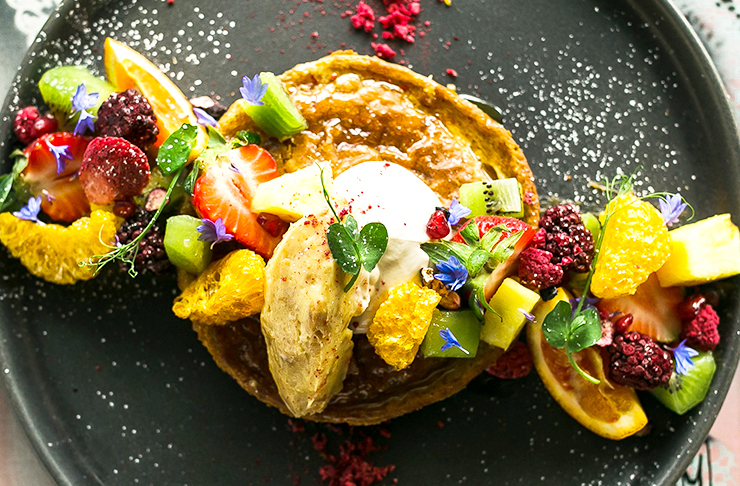 Possibly Auckland’s most Instagrammed café, Winona Forever serve a delicious (and oh-so pretty) buckwheat hotcake. It’s topped with seasonal and freeze-dried fruit with a spoonful of coconut yoghurt for good measure. Our advice? Opt to add bacon. Let’s be honest, is it really brunch if you don’t add bacon? Wash down with a peanut butter hot chocolate (yes, this is a thing) and you’ll be one happy bruncher. Guys, Russian pancakes are a thing and you’ll find them right here in Auckland. Moloko’s pancakes are made with the secret ingredients of ricotta and tvorog Russian cheese. The result? Super plump pancakes that are crispy on the outside and creamy on the inside—total pancake perfection. They’re served with grilled banana, seasonal fruit, sour cream and a generous dollop of lemon honey. So we all know and love red velvet cake, right? But have you tried red velvet hotcakes before? Nope, probably not. Well, Hello Friends + Allies is making all your pancake-slash-hotcake dreams come true with their red velvet delight. It’s paired with lemon mascarpone and pink candy floss (so pretty!). Stay in theme by finishing your brunch off with a red velvet mini-cake. When it comes to brunch, Dear Jervois can do no wrong. We mean, what’s not to love about matcha waffles, brekkie tacos and Nutella pancakes?! Yep, order the latter and you’ll be served a mega pancake stack with berry compote, crème fraîche and Nutella chocolate sauce—ermahgerddd. There’s the option to take things to a whole new level with the addition of maple walnut ice-cream. Go on, you deserve it. Twisted Tomato, you total brunch gem, you. If you like a) pancakes and b) caramel, this Point Chev fave has got your back (and your stomach). Their mega caramelised pancake is drizzled with toffee sauce, seasonal fruit and passionfruit mascarpone. Go for caramel-on-caramel by adding a scoop of salted caramel ice-cream—yass! Polish things off with a salted caramel shake because go hard or go home, right? You can’t call yourself a pancake fanatic until you’ve devoured Domain & Ayr’s famous fluffy pancake—it’s like an Auckland rite of passage. It’s soft, it’s fluffy and it’s bigger than any pancake you’ve seen before. They’ll be a bit of a wait for your brunch—the pancake takes 20 minutes to bake. But we promise you this: it’s worth every minute of the wait. It comes with mixed berries, mascarpone and the all-important drizzle of maple. It looks like pancakes are on the cards for your weekend brunch then, amiright? Don’t forget to pay with your personal ASB Visa credit card to score 15% off. What: ASB Brunch On Us. Pay for your weekend brunch with your personal ASB Visa credit card and you’ll enjoy 15% off—amazing! The discount will be applied up to the first $200 spent in any single transaction and ASB will credit the 15% ‘on us’ discount back to your credit card account. Where: Local cafes across New Zealand. Offer excludes fast food outlets, hotels restaurants/cafes and petrol stations. When: Weekends in November and December, between 8am and 12pm. Check out the full terms and exclusions here. Editor’s note: This article is proudly sponsored by ASB and endorsed by The Urban List. Thank you for supporting the sponsors who make The Urban List possible. Click here for more information on our editorial policy.